So much for finishing up old projects... I am starting a new flannel quilt, and this one will be for my bed - a king size thing which has been covered with everything but a quilt of mine. The ones on the left are (woolies) by Maywood Studio, in all the colors I like. The flannels on the right will be the background for this quilt called Crooked Path (fat quarter friendly!) from the book "Oh Sew Cozy Flannel Quilts" by Lynette Jensen (I found it here). I have made 5 flannel quilts from this book, which has great patterns for this type of fabric: not too elaborate, yet very attractive. The quilt I am working on is on page 75. The chevron columns are made with rectangles and squares - no sewing triangles! 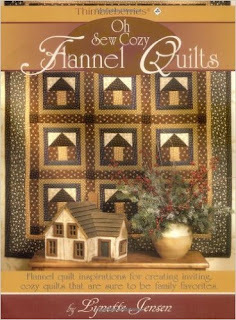 This book was published in 2004, when chevron patterns weren't as popular as today, and I love the easy construction. I will post pictures of blocks and columns as I work on them. I think it will turn out [huge] pretty!